This is Week 11 of 12 of the Summer of Sci-Fi Challenge. To see the full list of Summer of Sci-Fi titles, click here. I should probably begin by acknowledging that I'm not the target audience for this book. For one thing, I was born in the mid-'80s, so a lot of the pop culture references were lost on me. I wasn't watching MTV or hanging at the mall arcade as a three-year-old. For another thing, my experience with video games mostly involved playing Mario Kart against my brother, losing immediately, throwing the controller against a wall, and storming out crying. So a book that's basically one long ode to '80s geek culture isn't necessarily going to give me a big nostalgic buzz, the way it clearly does for people who recognize Cline's constant references. Adam read the book this spring and absolutely loved it. But then again, in his childhood he signed on to bulletin board systems on a hand-me-down PC running DOS. (I had to ask him how to word that sentence because none of it makes sense to me.) As I mentioned last week, my brother didn't want the book to end, but of course he's also the guy who danced at his wedding (in 2004) to Phil Collins's “Groovy Kind of Love” (released in 1988). 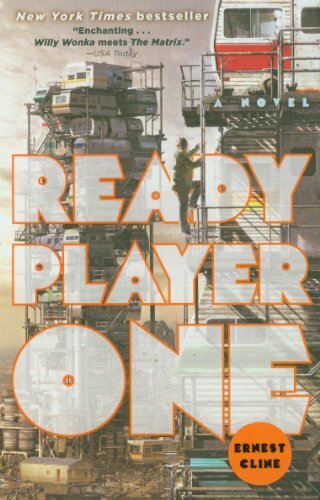 Even though I wasn't grinning in recognition at all the little asides, I enjoyed reading Ready Player One. There's plenty to like. Wade Watts, alliteratively named by his absent but comics-obsessed father, is a classic everyman of gamer culture—an overweight agoraphobe with bad skin. The year is 2044, and Wade spends most of his time in an abandoned van, logged into the Oasis, a massive virtual reality game that has morphed into his preferred method of interacting with the world. Technically Wade is enrolled in his senior year at a virtual high school run by GSS, the company behind the Oasis, but he spends most of his time and energy on something else. When James Halliday, the creator of the Oasis, passes away without heirs, his will stipulates that whoever solves a series of elaborate riddles he's embedded within the game will win his entire fortune. Since then, years have passed and no one has found anything, but Wade is determined to win. He immerses himself in everything Halliday loved: (you guessed it) classic video games and '80s pop culture. Following Wade on his way through the vast world of the Oasis is pretty entertaining. The narrative takes a while to get going though—there's a lot of exposition at the beginning, as Cline sets up the external world of 2044 and the virtual world of the Oasis. Then, of course, he has to spend considerable time explaining and describing the historical artifacts Wade studies on his quest to find Halliday's egg. It all starts to feel like one long list after a while. Fortunately, once the action starts, it builds quickly, and I ended up having to stay up past my bedtime to finish the book. One thing that I found interesting was how differently Cline seems to view technology's role in the future compared to most speculative fiction writers I've read. Usually technology is portrayed as something, if not to outright fear, then at least to approach with caution. The message often seems to be that with the advance of technology comes the erosion of our intelligence and creativity, and if we're not careful we'll end up mindless lumps, staring endlessly into our personal screens. Cline's character Wade takes the opposite view, describing the real world as polluted, dangerous, and beyond hope, and the virtual world of the Oasis as the only world worth living in. With the last sentences he perhaps tempers his argument a little, suggesting there may be some value to unplugging every now and then. Still, it was funny to consider the contrast between Cline's message (“Technology is the only thing that will save our world from being completely unlivable in the future”) and Atwood's message in Oryx and Crake (“Technology is the reason our world will be completely unlivable in the future”). If you grew up playing video games and listening to Rush and watching Pretty in Pink, you'll love this book. If, like me, most of that was outside your childhood experience, you'll probably still have a good time reading it. It's a fun adventure whether you know all the trivia or not. Now, if someone ever writes a book that combines '90s boy bands, friendship bracelets, and Babysitters' Club references, I'll be on it like white on rice. As always, I welcome your comments here or on Goodreads or Facebook. What did you like about Ready Player One? Were you as disappointed as I was that Duck Hunt didn't get a mention? Join us next Sunday for our very last installment of Summer of Sci-Fi, when we'll be discussing The Bees by Laline Paull. I can't believe summer is almost over, but what I really can't believe is I've now read 11 sci-fi books in 11 weeks. I had no idea what I was getting myself into, but I'm really glad I did it!